Cycles between any elements should be avoided as they have a negative impact on various properties of the software system, e.g. testability, maintainability, understandability, to name a few. Cycles can be examined in more detail by opening the Cycle Groups view. This view additionally shows the involved source files for component cycle groups. To analyze individual cycle groups, open the Cycle Group view via the context menu. 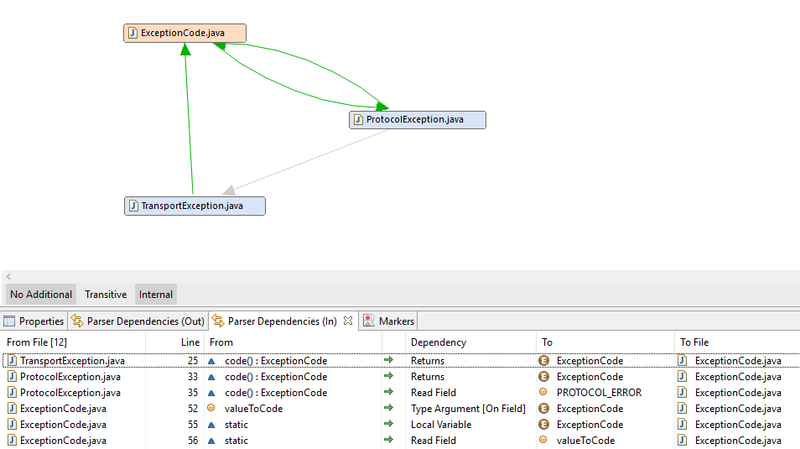 This view shows the involved elements and when selecting an element or a dependency, details to the dependency are shown in the Parser Dependencies views. Drill-down to the source code is supported via double-click on a dependency.